Your app's last version was released on February 15, 2011. It is important to regularly update your app. Best practices recommend to update your app every 4 to 6 weeks. This means fixing reported bugs, improving existing features, launching new features etc. Keep an eye on users' feedback. The next great features may already be asked by many users. This is a practice or game, etc., used basketball scoreboard app. On the support page, published movie! - iPhone4 and iPad support only. - validated resolution 1024x768, 800x600, 640x480. - iPhone3G, iPhone3GS, iPhone4 and iPad support. - validated resolution NTSC740x480 only. Not tested in PAL740x576. ※ How to set the game clock. "Set" button, then set the time and start time will be saved. 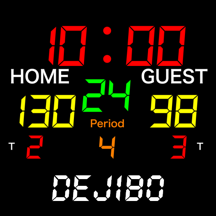 ※ Home Screen Settings "-> Dejibo " at "the number of team fouls"or "clicking sound" you can change the settings. ※ The buzzer volume is small, iPhone and iPad speaker issue. We recommend that you use the external amplified speakers. Digital display font: Copyright (c) Yourname, Inc.